Cows are ruminants with a digestive system that includes a few digestive organs not found in the simpler monogastric digestive systems of humans and many other animals. Other ruminant species include sheep, goat, elk, deer, moose, buffalo, bison, giraffes and camels. Other monogastric species include apes, chimpanzees, horses, pigs, chickens and rhinos. “Instead of one compartment to the stomach they (ruminants) have four. 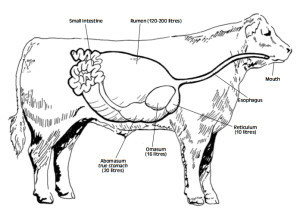 Of the four compartments the rumen is the largest section and the main digestive center. 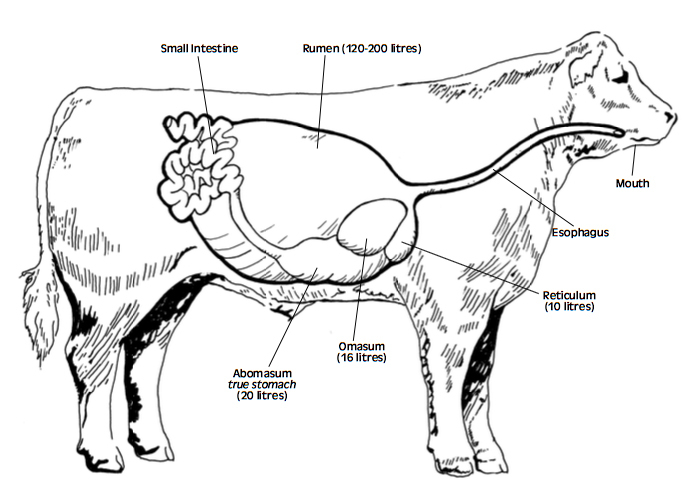 The rumen is filled with billions of tiny microorganisms that are able to break down (through a process called enteric fermentation) grass and other coarse vegetation that animals with one stomach (including humans, chickens and pigs) cannot digest. 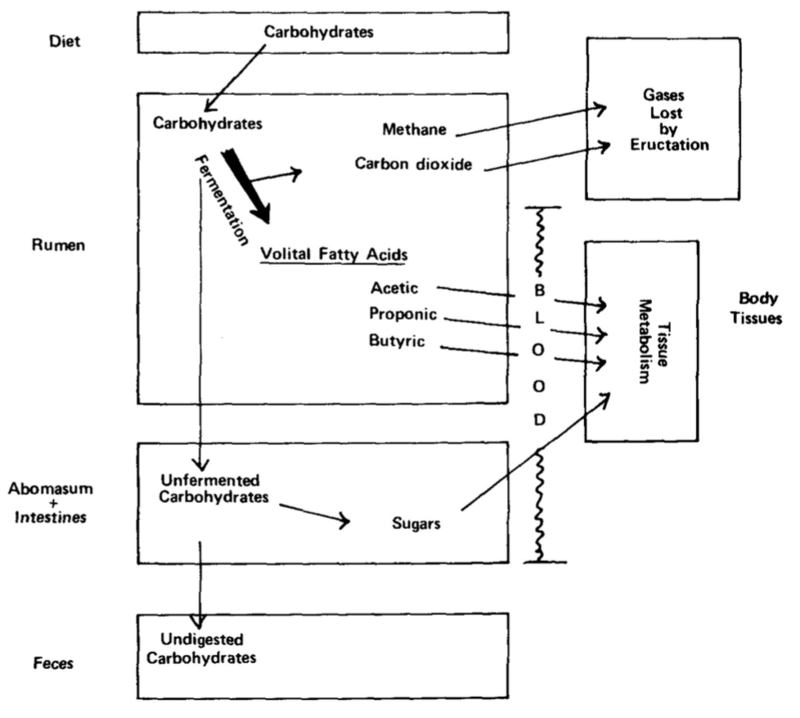 Generation of methane and carbon dioxide in ruminants results from their digestion of carbohydrates in the rumen (their largest digestive organ) as shown in the following process diagram. Cows don’t generate methane from metabolizing proteins or fats. Argentina’s National Institute for Agricultural Technology (INTA) has conducted research into methane emissions from cows and determined that a cow produces about 300 liters of gas per day. At standard temperature and pressure (STP) conditions, that exceeds the volume of a typical cow’s rumen (120 – 200 liters), so frequent bovine farting probably is necessary for the comfort and safety of the cow. Greenhouse gas emissions by economic sector are shown in the following EPA chart. 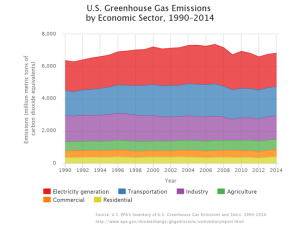 For the period from 1990 to 2014, total emissions from the agricultural sector, in terms of CO2 equivalents, have been relatively constant. “Methane is emitted during the production and transport of coal, natural gas, and oil. Methane emissions also result from livestock and other agricultural practices and by the decay of organic waste in municipal solid waste landfills. 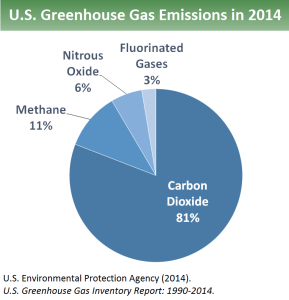 The components of U.S. 2014 greenhouse gas emissions and a breakdown of methane sources are shown in the following two EPA charts. 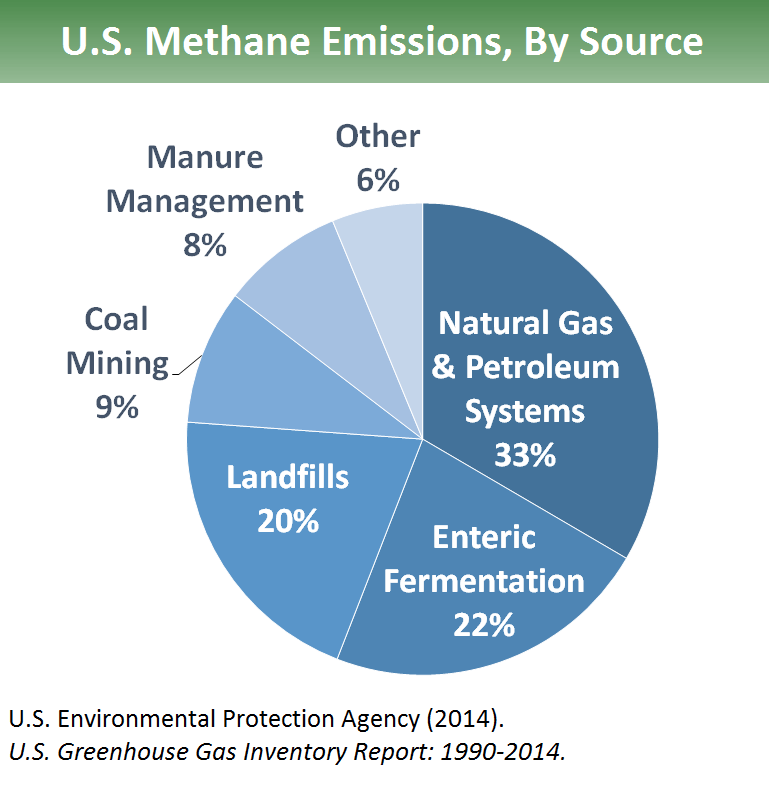 In 2014, methane made up 11% of total U.S. greenhouse gas emissions. 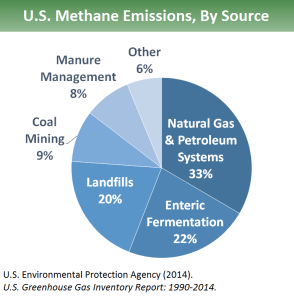 Enteric fermentation is the process that generates methane in the rumen of cows and other ruminants, which collectively contribute 2.42% to total U.S. greenhouse gas emissions. Manure management from all sorts of farm animals collectively contributes another 0.88% to total U.S. greenhouse gas emissions. EPA data from 2007 shows the following distribution of sources of enteric fermentation among farting farm animals. So it’s clear that cattle are the culprits. 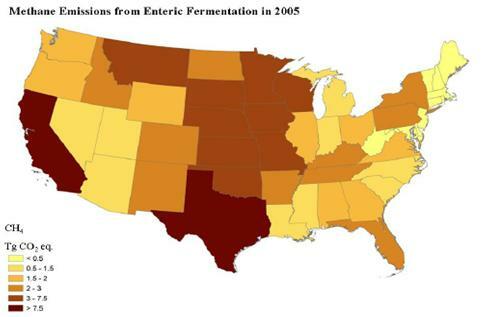 By state, the distribution of methane production from enteric fermentation is shown in the following map. Here, the top five states based on cattle population are: (1) Texas @ 11.8 million, (2) Nebraska @ 6.3 million, (3) Kansas @ 6.0 million, (4) California @ 5.2 million, and (5) Oklahoma @ 4.6 million. Total U.S. population of cattle and calves is about 89.5 million. This brings us back to California’s new law. By 1 July 2020, the State Air Resources Board is required to assess the progress made by the dairy and livestock sector in achieving the goals for methane reduction. If this assessment shows that progress has not been made because of insufficient funding, technical or market barriers, then the state has the leeway to reduce the goals for methane reduction. 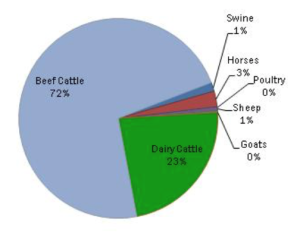 As shown in a chart above, several different industries contribute to methane production. One way to achieve most of California’s 40% reduction goal in the next 14 years would be to simply move all cattle and dairy cow businesses out of state and clean up the old manure management sites. While this actually may happen for economic reasons, let’s look at some technical alternatives. 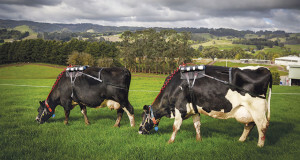 Develop new feed for cows, which could help cows better digest their food and produce less methane. 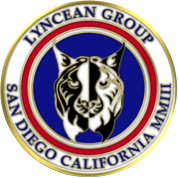 Any type of genetically modified organism (GMO) doesn’t go over well in California, so I think a GMO reduced methane producing cow is simply a non-starter. A cow’s diet consists primarily of carbohydrates, usually from parts of plants that are not suitable as food for humans and many other animals. 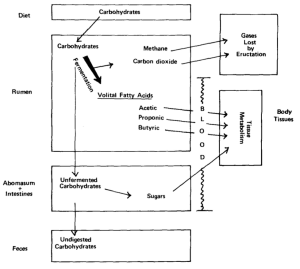 The first step in the ruminant digestion process is fermentation in the rumen, and this is the source of methane gas. The only option is to put cows on a low-carb diet. That would be impossible to implement for cows that are allowed to graze in the field. Based on a cow’s methane production rate, putting a cork in it is a very short-term solution, at best, and you’ll probably irritate the cow. 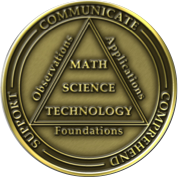 However, some humorists find this to be an option worthy of further examination. That leaves us with the technical option of collecting the methane from the cows. Two basic options exist: collect the methane from the rumen, or from the other end of the cow. 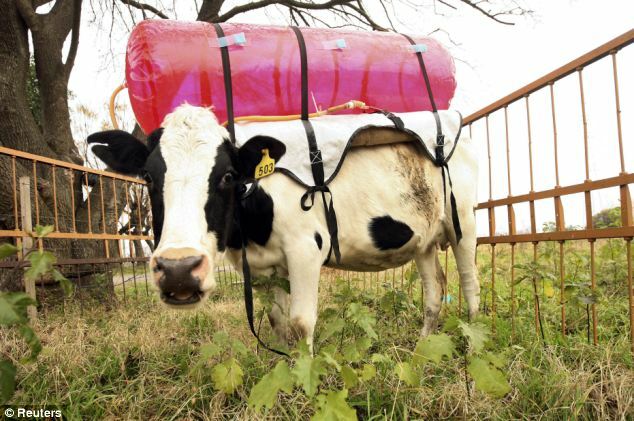 I was a bit surprised that several examples of methane collecting “backpacks” have been developed for cows. Unanimously, and much to the relief of the researchers, the international choice for methane collection has been from the rumen. So, what does a fashionable, environmentally-friendly cow with a methane-collecting backpack look like? Argentina’s INTA took first place with the sleek blue model shown below. Another INTA example was larger and more colorful, but considerably less stylish. Even if this INTA experiment fails to yield a practical solution for collecting methane from cows, it clearly demonstrates that cows have absolutely no self-esteem. 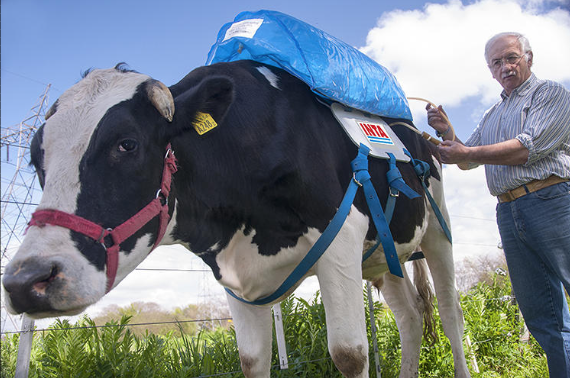 In Australia, these cows are wearing smaller backpacks just to measure their emissions. Time will tell if methane collection devices become de rigueur for cattle and dairy cows in California or anywhere else in the world. While this could spawn a whole new industry for tending those inflating collection devices and making productive use of the collected methane, I can’t imagine that the California economy could actually support the cost for managing such devices for all of the state’s 5.2 million cattle and dairy cows. 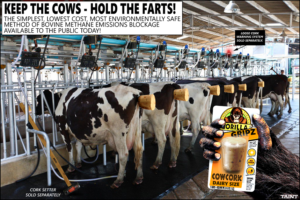 Of all the things we need in California, managing methane from cow farts (oops, I meant to say enteric fermentation) probably is at the very bottom of most people’s lists, unless they’re on the State Air Resources Board.